This NFC tag can be read with any NFC enabled devices such as cell phones, tablets and fixed readers. It complies with the NFC Forum Type 2, has 144 bytes of memory and can be read up to 70mm. The small form factor, 27mm x 27mm x 5.5mm, can easily be mounted to indoor and outdoor assets. The Ironside Micro™ is a ruggedized NFC Tag, is designed for harsh environments and to be uses for high impacts, chemicals and moisture applications. The Ironside Micro can be mounted on metal, has an exceptional level of robustness against the demanding requirements of industrial and tracking applications. Ironside Micro encapsulation is IP68 level and it requires only an area of approximately one square inch. It is also designed for extended chemical resistance. 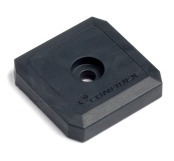 The Ironside Micro is manufactured by Confidex.